Good news! The Tovolo Stainless Steel 12"Dough Whisk has arrived in Singapore. 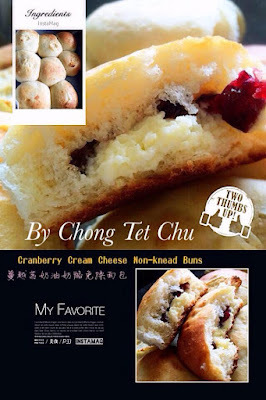 Few weeks ago, when I did a video tutorial using the dough whisk to make the Moist & Smooth Cranberry Yogurt Muffins, some readers have asked me where they can buy this in Singapore. You can now find it at all Robinsons, Metro Centrepoint, Takashimaya, www.tovolo.com.sg and www.hipvan.com. I have done up another video tutorial, this time showing you how to use the dough whisk to make these delicious and healthy 'Wholemeal Cranberry Cream Cheese Non-Knead Buns'. As introduced before, the dough whisk is also known as the Danish Dough Whisk or Brotpisker in Danish. It is an essential tool for all bakers as it can do chores like mixing muffin batter, mixing heavy dough prior to kneading and other batters which you don't want to beat for fear of toughening your bakes. This specialized baking tool is way better than a whisk and definitely easier to clean too. Click this YouTube link if you can't watch from here. 2. Put the yeast into the water and mix well. 3. Mix the eggs, sugar and salt well. Add in the honey, mix well then add the yeast water, mix well again. 4. Pour the egg mixture into the flour, use the dough whisk to mix in the flour till well mixed. Then add in the butter and mix well. Cover the bowl and put it into the refrigerator to proof overnight. 5. Prepare the cream cheese mixture. Use an electric mixer to mix the cream cheese and icing sugar together until smooth. Divide and put it back to fridge to harden for easier wrapping. 6. Next day, take the dough out of the fridge, punch out the air and divide the dough into 16 portions of 60g each. 7. Wrap in the dried cranberries and cream cheese, seal the buns and proof for 30 minutes. 8. Put a piece of baking paper or mat over the proofed buns and another baking tray on top of it. 9. Preheat oven, bake at 210 degree Celcius for 10 minutes, remove baking tray and paper or mat, bake for another 3~5 minutes . 10. Transfer to a cooling rack to let cool. 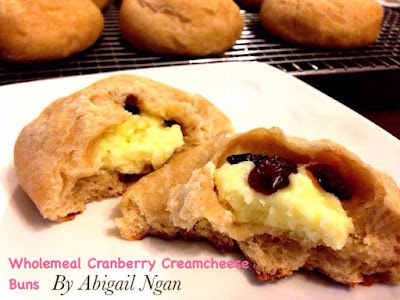 Abigail Ngan says: "Thanks so much for your recipe! It's so delicious, soft and fluffy. My family's favourite! Better than those selling outside!" Chong Tet Chu says,"Love this recipe! The part I like most is it's non-knead and just proof in the fridge, no need to wait. The buns are soft and fluffy! Thanks for your great recipe!" What a great tool! Between, this bread is wonderful served with cream cheese filling. This is one of my favourite buns. Used to buy them from Barcook too. Hi, for this non-knead bread, after mixing the dough, can it be left in room temperature for a few hours then bake rather than keep in fridge overnight? Hi Es, you can leave the dough in the fridge for at least 3 hours instead of leaving overnight. May I ask after mixing the dough and filing cheese, can i keep in frigde for few/how many day to bake it after several day? Hi Abi, I would suggest you bake it first then freeze the baked buns (up to one month). Afraid that the bread dough may become sour in the fridge due to over-fermenting.